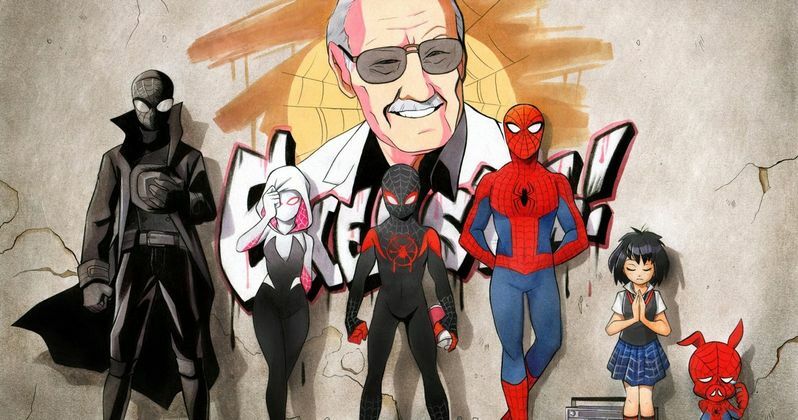 There are over a dozen Stan Lee cameos in Spider-Man: Into the Spider-Verse. Producer Chris Miller reveals that fans have a lot more detective work to do when they watch the critically acclaimed animated movie. The news comes after a Spider-Man fan found another cameo that needs the movie to be put on pause to see and now, after Miller's words, the hunt has started to find out where the rest of them are. The major Stan Lee cameo in Spider-Man: Into the Spider-Verse isn't hard to spot at all, but these new ones are going to take a while to find. When Chris Miller made the announcement, he also revealed another Lee cameo that fans missed the first time around. Miller had this to say about the crazy amount of Stan Lee cameos in Spider-Man: Into the Spider-Verse. "To all those who got excited about the Spider-Verse hidden 2nd Stan Lee cameo on the train: Stan is all over the movie, dozens of times. Who's walking over Miles when he says thanks, New York?" Nick Kondo, an animator on Spider-Man: Into the Spider-Verse, posted a quick clip on social media to promote the Blu-ray release in March. The brief bit of footage features a shot from the closing sequence as Miles Morales, suited up as Spider-Man, swings through New York City. Kondo offered fans a quick tip by taking the clip and slowing it down. When shown in slow motion, you can see riders on the subway, one of which just happens to be Stan Lee. It's incredible to think of the amount of work that went into creating the Spider-Verse. "The easiest to spot, because you don't have to stop the film, is when Peter and Miles are on the ground on the sidewalk, after they'd fallen from the train, there's a dog who smells them with a guy who walks over them. That's Stan again. On his way home from work. But then I will say, there are many, many train scenes. Subway shots. If you just pause, he's in a lot of them. That guy is all over New York. He's a busy man." With Spider-Man: Into the Spider-Verse coming to Blu-ray next month, there are about to be a lot more Stan Lee sightings. Fans will more than likely take apart the whole movie, watching it in slow motion to see where Stan the Man pops up next. It's like a way cooler version of Where is Waldo set in the Marvel universe. You can check out the announcement of a lot more Lee below, thanks to Chris Miller's Twitter account. The Excelsior! Into the Spider-Verse art is by FinikArt.